I’ve been following the Crest and Oral-B Pro-Health Clinical Plaque Control regimen for a few weeks now, and I’m ready to talk about the results. I shared the basics of the program in my first post for the blog tour, but I’ll refresh your memory real quick in case you don’t have time to go back and read it. The Crest and Oral-B Pro-Health Clinical Plaque Control regimen (sheesh, that’s quite the mouthful, no pun intended!) consists of several different Crest and Oral-B products that are designed to help keep your mouth feeling healthy and clean between dental visits. Crest Pro-Health Clinical Plaque Control Toothpaste – This toothpaste not only helps reduce the plaque that’s already on your teeth, but it also prevents it from building up in the first place. It works really well and leaves your mouth feeling fresh, but I have to admit that I found it a bit gritty. I think that’s part of the cleansing action, and it definitely helps, I just don’t really like that sensation. Still, the benefits far outweigh a little sensory annoyance for two minutes. Crest Pro-Health Clinical Rinse– I’ve been a big fan of Crest Pro-Health mouthwash since it first came out, and this version is even more powerful at combating nasty germs. Even though it’s a stronger mouthwash when it comes to destroying plaque, it still doesn’t have that nasty burning feeling that alcohol-based mouthwashes have. In fact, it’s gentle enough for Jacob to use. Oral-B Clinical Pro-Flex Toothbrush- Okay, I admit that at first I thought this toothbrush was a little weird, what with it’s hard orange rubber ring thingy at the base. Turns out that little rubber ring does a lot of hard work when it comes to cleaning your teeth. It helps make the bristles on the brush more flexible, which in turn helps them reach all the random areas of your mouth. Aside from the rubber thing, the toothbrush is gentle yet firm on your gums and teeth. It removes more plaque from your gumlines than a regular toothbrush. Oral-B Glide Pro-Health Clinical Protection Floss I am super picky about floss. I can’t stand anything that shreds or drags between my teeth. I absolutely love the Oral-B Glide Pro-Health floss though! It’s smooth, gentle, and incredibly effective. The lovely minty taste definitely helps! 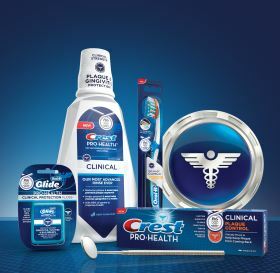 Overall, I was really happy with all of the Crest and Oral-B Pro-Health Clinical products. Like I said, I would have preferred the toothpaste to be a little less gritty, but other than that everything performs exactly as expected and leaves my mouth feeling sparkly clean. These products are really easy to incorporate into your daily routine because they’re all things you should be using anyway. No need to add extra steps to your regimen- just swap out your existing products for the Pro-Health Clinical line! I wrote this review while participating in a test drive campaign by Mom Central Consulting on behalf of Crest and Oral-B and received product samples to facilitate my candid review. Mom Central Consulting sent me a promotional gift to thank me for taking the time to participate. Orab B failed to honor my $40 rebate and when I sent them a follow up letter it was returned unopened with a stamp saying ‘offer expired’. This toothbrush will fail at some time, I will not repurchase any of their products.